Sometimes Tuscan Traveler wants to go someplace out of this world. La Silla Observatory run by the European Southern Observatory seemed to be the best place to start. ESO operates three unique world-class observing sites in the Atacama Desert region of Chile: La Silla, Paranal and Chajnantor. 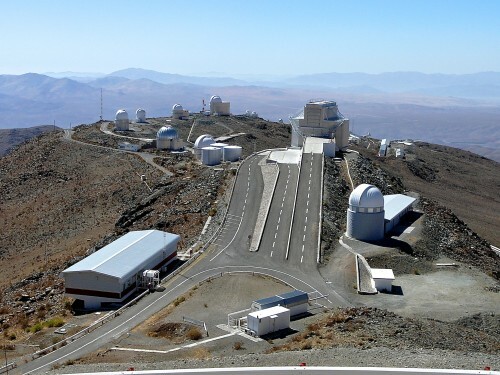 ESO’s first site is at La Silla, a high desert mountain 600 kilometers north of Santiago, Chile. 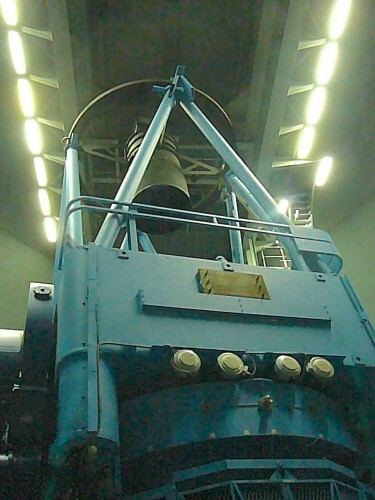 It is equipped with several optical telescopes with mirror diameters of up to 3.6 meters. 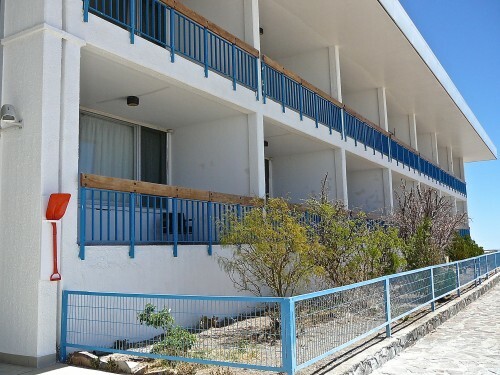 La Silla has been an ESO stronghold since the 1960s. And, among other things, they are looking for earth-like planets, which may be important two days from now. 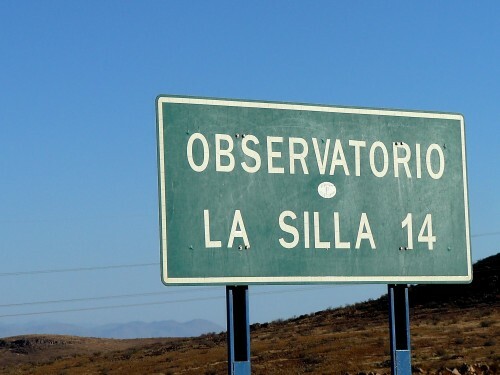 The La Silla Observatory is located at an altitude of 2400 meters (about 6,250 feet). 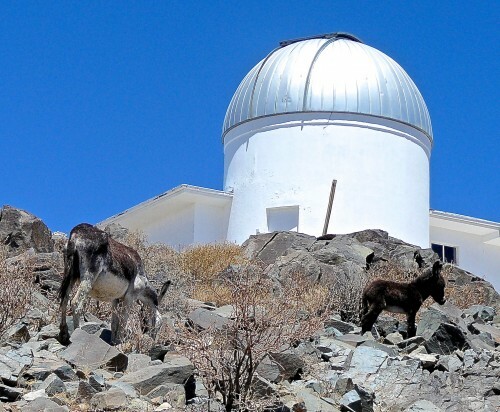 Like other observatories in this geographical area, La Silla is sited far from sources of light pollution. 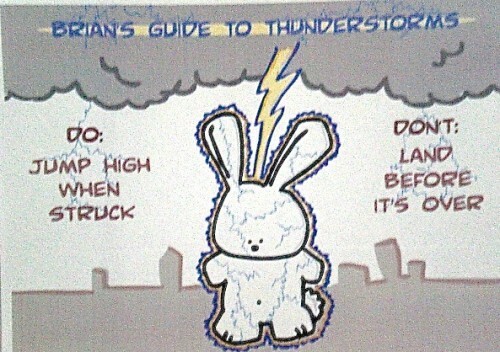 It has one of the darkest night skies on the Earth. Unfortunately, folks like us can only visit during the daytime. So we rented a Suzuki compact (first mistake) in Santiago and headed north on Highway 5 toward La Serena. We overnighted at Hacienda Santa Cristina (great choice) near Ovalle. 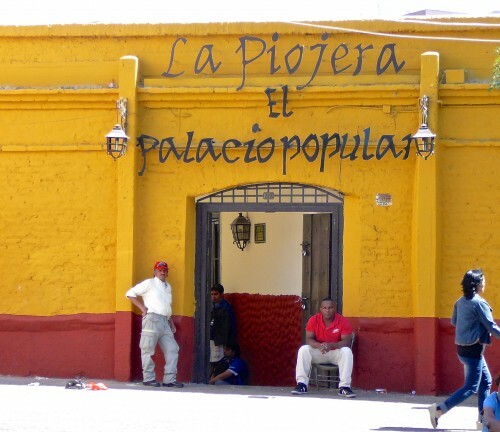 The next day, despite the fact that we had a strict 1:30pm appointment at the La Silla entry gate, we decided to take in the fish market at Coquimbo (second mistake) where we were so intrigued by the swords made out of swordfish blades, we dropped an hour behind our schedule. 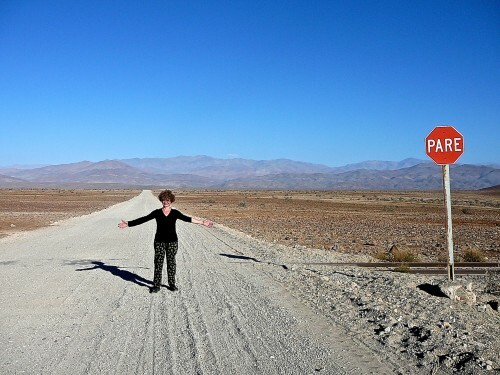 North of Las Serena, Highway 5 becomes a two-lane winding road full of long-haul carriers climbing over 6,000 feet from sea level to the high desert. No place to pass. But there is worse to come. Once on La Silla’s private road you really need an SUV. For over five miles the washboard road shook the Suzuki to bits. But having started out from the fish market an hour behind schedule, we arrived only 15 minutes late, just about the time 50 Chilean schoolchildren in two rickety buses, a young couple in another Suzuki, and a older pair of Swiss nationals in a four-wheel-drive (you can count on the Swiss to be prepared) arrived. The caravan, duly checked in, wound up the last 1,200 feet in altitude (losing the buses to overheating) to the observatory. A burro mother and child made better time than we did. 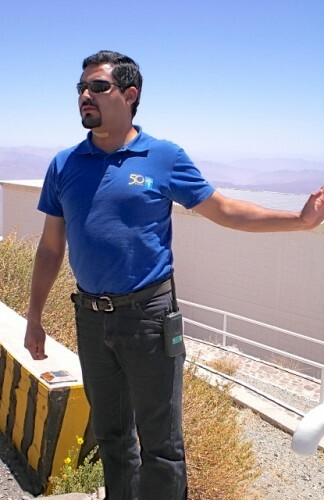 At La Silla, ESO operates some of the most productive 4-meter class telescopes in the world. The 3.58-meter New Technology Telescope (NTT) broke new ground for telescope engineering and design and was the first in the world to have a computer-controlled main mirror (active optics), a technology developed at ESO and now applied to most of the world’s current large telescopes. The ESO 3.6-meter telescope is now home to the world’s foremost extra-solar planet hunter: High Accuracy Radial velocity Planet Searcher (HARPS), a spectrograph with unrivalled precision. 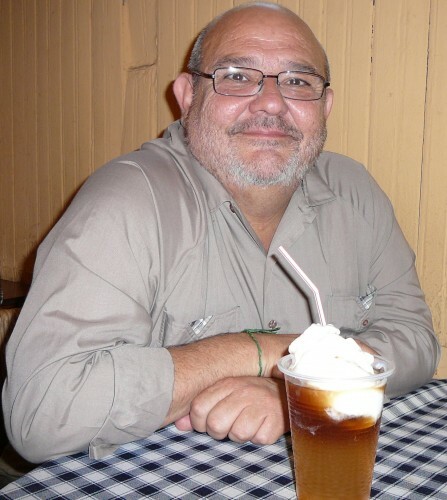 We toured with Carlos Corco, an excellent guide (speaking both English and Spanish), who is a graduate student in Astronomy and Physics at the university in La Serena. Three other students, who corralled the 50 school children with great skill, assisted him. 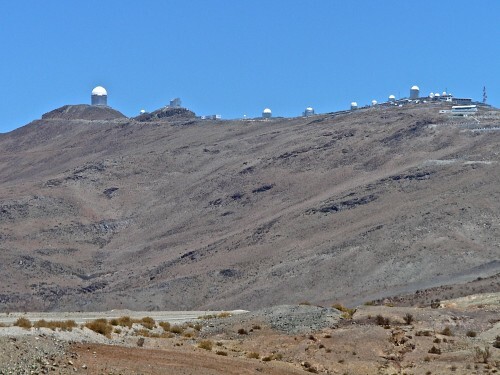 For three hours we saw most of the facilities on the mountaintop, including the dormitories (scientists stay from Monday to Friday), the research offices (full of computers , but empty of personnel on Saturday) and the two main telescopes, the NTT and the ESO 3.6 meter. 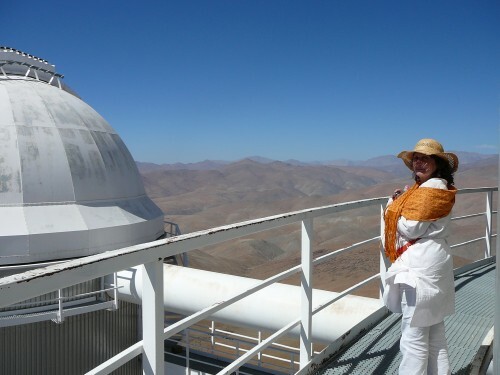 Not only did we tour the outside of the facility , but we entered the freezing inner sanctum of the ESO 3.6 meter telescope and then climbed to the narrow observation walkway clinging to the side of the dome. Just as we were getting ready to leave the manager of the facility arrived to give us the extra treat of a 360-degree ride on the NTT telescope. 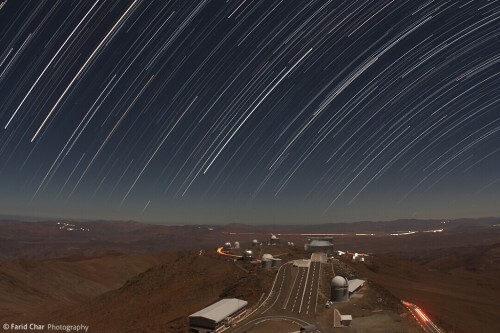 With about 300 publications in scientific journals attributable to the work of the observatory per year, La Silla remains at the forefront of astronomy. It now takes about a year in the waiting line for a scientist to get their project on the night’s list for time on the appropriate telescope. La Silla has led to an enormous number of scientific discoveries, including several “firsts”. The HARPS spectrograph is the undisputed champion at finding low-mass extra-solar planets. It detected the system around Gliese 581, which contains what may be the first known rocky planet in a habitable zone, outside the Solar System. Several telescopes at La Silla played a crucial role in linking gamma-ray bursts – the most energetic explosions in the Universe since the Big Bang – with the explosions of massive stars. 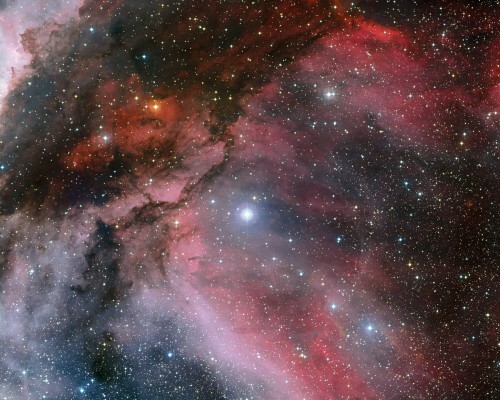 Since 1987, the ESO La Silla Observatory has also played an important role in the study and follow-up of the nearest recent supernova, SN 1987A. On February 2, 2011, astronomers using the Wide Field Imager on the 2.2m telescope discovered an unusual pure disk galaxy christened NGC 3621. Although the tour is in the daytime when nary a star is seen, the experience of being high above the Atacama desert with panoramic views in all directions make this an out of the world experience. 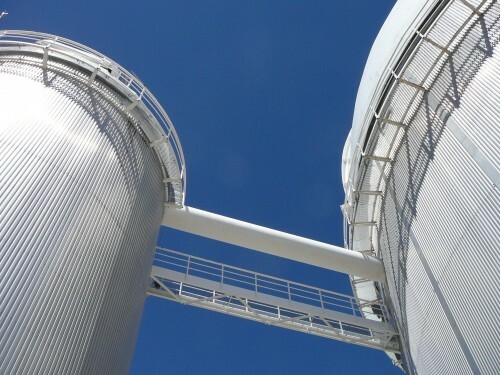 Next time I am in the Atacama Desert I want to go to visit Alma, which had its official opening two weeks ago. 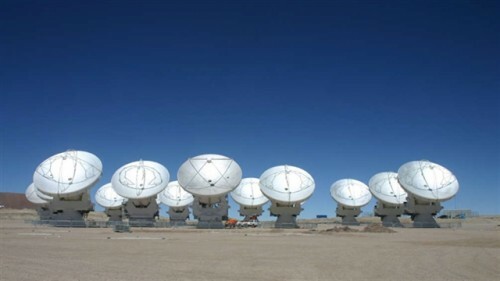 Alma is located at 16,000 feet in altitude hundreds of miles north of La Silla. 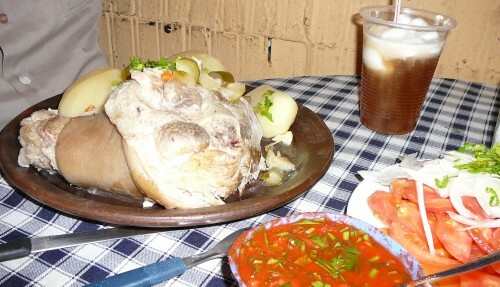 Read about Alma here. This time I will fly in for the visit.